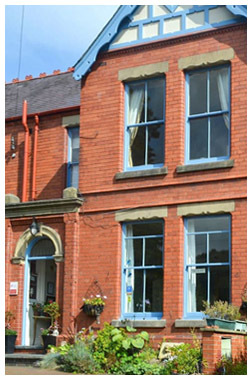 Glasgwm Bed and Breakfast is accessed on foot from Abbey Road, two hundred yards from Llangollen Bridge. This stretch of Abbey Road is flat. The front of the property has adequate parking for five vehicles. The surface is block paving, and there is a steady, but gradual incline from the pavement to the front door. Two steps at the front of the property need to be taken to gain access to the porch, and then an inner door to the hallway. The first of these steps has an above average riser. On the Ground Floor is the Guest Lounge and Dining Area, both with easy access. At the back of the hallway is a small W.C., available to guests if needed, but located in a small space. A flight of fourteen stairs, of an average riser, need to be negotiated to the Single Bedroom. The ensuite contains a bath, but not a shower. The bath is old, deep, and spacious, but the bathroom does not contain a handrail to aid access into and out of the bath. Three more stairs need to be taken to the landing area, off which both Doubles and the Twin Room are located. All three rooms are spacious and ensuite. The Kingsize has a bath, and shower accessed by stepping into the bath. No handrail is provided. The other two rooms have showers. The Twin Shower requires guests to step into it, a height similar to climbing one stair. The Double has a larger shower with a much smaller step into it. Following an inspection by the Fire Service in 2013, all bedrooms and public areas are fitted with the requisite fire alarms. In addition, the Guest Lounge door, and all four Bedroom doors are now fitted with Door Closers. They provide some resistance to the person trying to open the door, but would only inconvenience those guests with very little strength in their arms. This Access Statement was updated on the 28th February 2015.